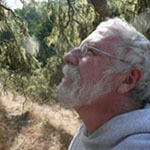 Distinguished Fellow Tim Collins is an artist, his creative inquiry began with water and has evolved to include ecosystems and ideas of subject/object exchange between humans and LIVING things. Tim’s experiences include extensive teaching, research, writing, fundraising and administrative duties. He has completed extensive work on the Eden 3 Project, as well as a publication for RACAR, a Chapter for an upcoming book on Embodied Values and a book proposa, dealing with Art and Environmental Change. He has also been asked to Scontribute to a chapter for a book on Landscape Research. As an artist-research fellow at the STUDIO from 1997-2005 he co-directed 3 Rivers 2nd Nature and the Nine Mile Run project with collaborator Reiko Goto. In the fall of 2005, they began the process of organizing and initiating a series of public programs, a conference and an exhibition that will elucidate international approaches to art, ecology and planning.